Firstly, it wasn’t Fireman Sam who apparently slipped on a page of the Qur’an; it was Elvis. But the headline ‘Elvis slips on the Qur’an’ would probably cause problems for Graceland or incite hatred against Priscilla and Lisa Marie, so best to go with the brand name, though one understands that this may cause Sam, who is manifestly innocent, some minor inconvenience. You’d think this would be a complete non-issue. 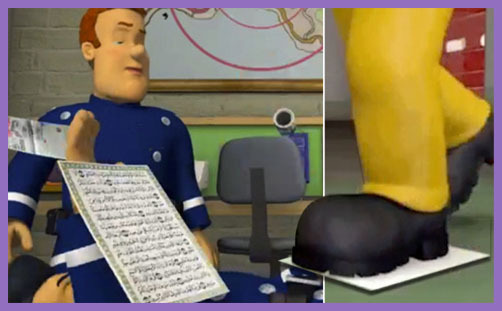 It is a children’s programme, after all, and neither Fireman Sam nor his mate Elvis is recognisably Muslim (at least not practising), so a page from the Qur’an is, to them, just another piece of paper; the Qur’an just another book. If they (accidentally) tread on it, well, that’s unfortunate, but you’d hardly think it would merit a major media brouhaha, with the BBC, Telegraph and the whole Islamic world up in arms (not literally – yet). And on day when a French priest had his throat slit by Islamists while he was celebrating Mass, you might think the ‘biggest story on Muslim twitter‘ would at least be a wave of assertions that such atrocities are “nothing to do with Islam”; and that the Assistant General Secretary of the Muslim Council of Britain might have something more socially-cohesive to tweet about. But no, Miqdaad Versi is incensed not by the murderous actions of his co-religionists and their onslaught against Christendom (about which he utters not a word), but by the depiction of a Surah Mulk (67), verses 13-26. Mattel, who make the programme, profusely apologised for the “error” and for any distress or offence caused. (But given that Fireman Sam’s creator, David Jones, was once held by Gatwick Airport security for asking why a veiled Muslim woman was not properly checked, it may not have been an error at all). HIT Entertainment, who produce the programme (along with ‘Thomas the Tank Engine’ and ‘Bob the Builder’), also apologised unreservedly, and announced they were cancelling their contract with the animation studio responsible for making the scenes. The episode (‘Troubled Waters‘) has been pulled from circulation: it is apparently no longer available to view anywhere (though Elvis slipping on the offending page is all over YouTube [for the time being]). Perhaps self-censorship in this instance is fair enough: the last thing Mattel or HIT want is the Charlie Hebdo treatment. Nor do they particularly want to be tarnished with ‘Islamophobia’ and lose a lucrative audience: Thomas the Tank Engine doesn’t transport kegs of beer, and Bob the Builder is never portrayed eating a bacon sandwich. Why cause gratuitous offence? So Sharia Sam (as he will henceforth be known) must also comply with Qur’anic injunctions to treat the word of Allah with reverence, and Mattel are reviewing their content production procedures to ensure the Qur’an is never disrespected again. They are also considering proposals for ‘Tahmid the Tank Engine’ and ‘Babar the Builder’. 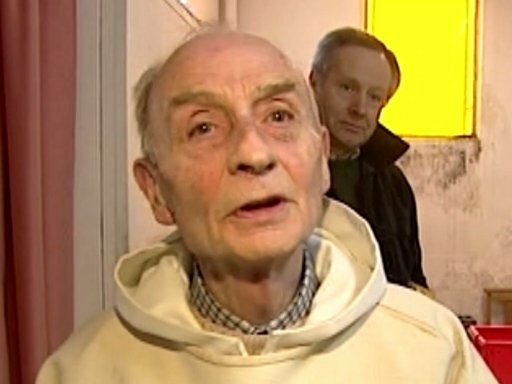 Abbé Jacques Hamel, a humble, dedicated, faithful priest since 1958, martyred at the grand old age of 85 for his faith in Jesus Christ. He is the 236th victim of 11 jihadist attacks in France since January 2015. But his murder wasn’t random: when Islamists target a priest celebrating Mass, they are attacking the divine communion at the heart Christendom. Christians throughout the Middle East have lived with such threats for decades and centuries: Christians in Europe will now reap what our political leaders have sown. And his solution for dealing with it? “I think the appropriate response,” he said, “is to be firm about the Christian origin of our own nation, and certainly in Europe, and the Christian foundations of the government, and to fortify those.” Okay, that sounds like a plan. 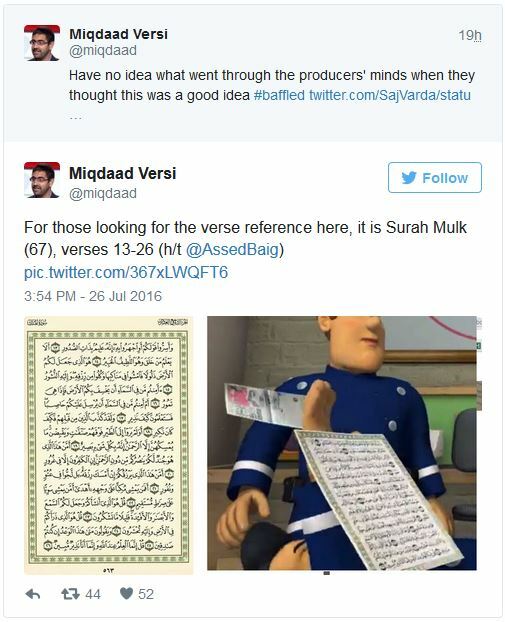 But if that fortification doesn’t begin with an unequivocal assertion that Fireman Sam and his mate Elvis are perfectly free to do whatever they want to a page of the Qur’an – while fully respecting Mattel’s freedom to make a commercial decision to apologise and withdraw the episode from circulation – then the foundations are already dangerously sandy.